Occupying a fine riverside site on Western Road, The River Lee Hotel deserves its place as one of the most popular Cork hotels, especially perhaps for business guests. 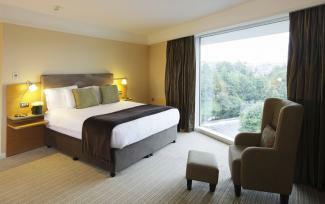 Conferences/Banqueting (150); business centre, secretarial services, video conferencing, laptop sized safes in bedrooms. Rooms 182 (4 wheelchair friendly). Room rate (2 adults) from about €135. Children welcome (under 12s free in parents' room, cot available free of charge, baby sitting arranged. Laundry/dry cleaning. Lift, 24 hr room service. Free wifi. Weir Rooms: Breakfast Mon-Fri 6.30-10.30, Sat & Sun 7am-11am; brunch daily 8am-3pm, D 6-9.30, a la carte. Bar food daily. Wine from €25. Leisure centre (pool, fitness room, jacuzzi, sauna); Spa (massage, treatments, beauty salon); tennis. Open all year. Amex, MasterCard, Visa. Following complete redevelopment of their original riverside site on Western Road, The River Lee Hotel regained its place as one of the most popular Cork hotels, especially perhaps for business guests. Well-located, it is beside the university and within comfortable walking distance of the city centre in good weather, and also handy for those who wish to make a neat exit westwards on leaving the city. Although it may not have the wow factor of some of the showier new hotels, it is imaginatively designed to make the very most of its waterside location, with all the main public areas having balconies as well as acres of glass - and the relatively low key decor is designed to last. Terrace on the Weir, which also takes full advantage of the riverside setting and has a large deck, enjoys a reputation of being a lively bar. 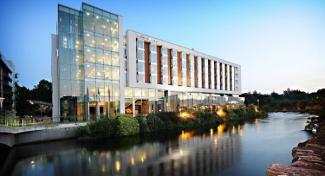 The River Lee Hotel is also renowned as a business hotel, and fills that niche particularly well. The underground carpark (accessed by lift from the foyer) is extremely convenient and the business facilities offered include a range of meeting rooms and a dedicated executive floor and lounge on the penthouse floor; executive extras include complimentary continental breakfast and drinks and canapés in the evening as well as turndown service, daily newspapers and business magazines. All bedrooms have been finished to a high specification, however, with air conditioning, 25" LCD TV, work desk, laptop safe, 'fair price minibar' as standard, and smart bathrooms all have separate bath and power shower and classy toiletries. Here again, good design is a feature that makes this hotel stand out – without being at all showy, rooms have many thoughtful details incorporated which make for a very comfortable stay, and the same applies to the bathrooms. Leisure facilities include an 18m swimming pool, sauna, spa bath and a day spa. Dining is always a pleasure in the informal Weir Bistro, an attractively bright and airy space at the end of the hotel with a surprisingly away-from-it all feeling that belies its position just a river-hop away from the busy Western Road; where else in the city centre could you watch a man out fishing with his dog, just yards from your table? And, as elsewhere in the hotel, this is a place where anyone expecting standard hotel fare may have a very pleasant surprise in store. Friendly and obliging staff give out all the right vibes from the outset, as do Head Chef Paul Lane’s menus, which begin encouragingly with a sourcing statement and promise simplicity. So far so very good indeed, and happily the promise is kept in fresh, appetising modern classic cooking. Well-made starters are sure to please, and main courses offering perhaps 50% fish and seafood, will also include local meats – Macroom rack of lamb, perhaps. Small details give side dishes a fresh slant (citrus salt with the French fries, perhaps), and the dessert menu includes a range of Cork cheeses (served with homemade chutney). Interested staff have the companionable touch that makes a business hotel feel homely, and the same warmth and quality are evident at breakfast, which should be another pleasant experience and is served in the same room. On left, shortly before University College Cork. Watch closely for signs in one-way system.